In 2007, Dubai World announced that they will invest more $200 million in the Rwandan tourism industry. It included projects such as hotels, lodges or real estates, but also the construction of airflied near Gabiro. However in 2009 and 2010, a severe crisis hit the Dubai economy. The Emirat was near the collapse. Most of project in Rwanda were scrapped, except for the Dubai World Nyungwe Forest Lodge. Here is another good review, by Martha Burr. A cutting-edge destination for eco-tourism, Rwanda’s top luxury safari lodge borders the continent’s largest mountain rainforest and offers extraordinary chimpanzee trekking. Rwanda offers a luxury boutique resort experience not to be missed at the edge of one of the continent’s oldest mountain rainforests. 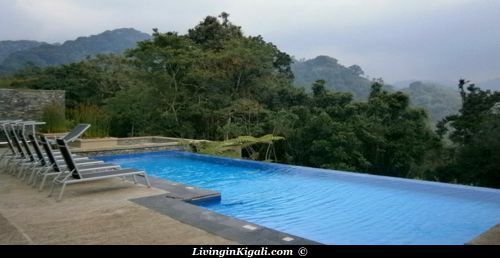 Nyungwe Forest Lodge sits like a dream on a rolling hilltop in the midst of the vast working Gisakura Tea Estate, with airy private bungalows that sometimes offer fleeting views of monkeys springing past in the forest. Guests here pass the time lounging, mingling and sipping fresh passion fruit cocktails in a sprawling glass-walled lobby and bar overlooking sublime mountain views as clouds roll through. Stylish modern décor of wood and stone incorporates contemporary African design elements that flow to the adjacent high-beamed dining room flanked by two romantic fireplaces. The restaurant patio offers spectacular morning and sunset views of the misty hills. For dinner, Continental cuisine tinged with local flavors is elegantly presented in a setting adorned with candlelight and white tablecloths. Meals are all-inclusive, but wine from a well-appointed list that features some fine South African choices is extra. An afternoon African tea ceremony highlights the fruits of the surrounding plantation, where guests can even try their hand at harvesting tea. Located down a winding plantation path, each of the 24 spacious wooden bungalows offers safari-chic comfort, with slate-walled rain showers, deep soaking tubs, fireplaces and tall glass doors that open onto large, private patio decks just a few feet from the lush rainforest. African art and artifacts surround downy king-size beds, and indulgent extras include chocolates at turndown, daily shoe cleaning and heated towel racks. Additional pampering can be found at the infinity pool. Perched on the edge of the rain forest, it’s a great spot to watch frolicking colobus monkeys or to have a massage. As with many other aspects of the resort, spa treatments feature local ingredients, including tea leaves. Nyungwe National Park is the largest remaining tract of mountain rainforest in East Africa, and the lodge offers a diverse selection of activities that showcase it, ranging from picturesque monkey-viewing or bird-watching walks to waterfall trails, canopy walkways and challenging jungle hikes. The main draw, though, is the exclusive guided chimpanzee trekking. The park has roughly 400 chimps, and this exhilarating adventure safari experience up steep mountain terrain takes guests through mud, moss and fern, deep into the forest primeval for an unforgettable glimpse of chimps in the canopy above. Rates: $220/$320 per person, minimum stay two nights; inclusive of breakfast, lunch and dinner. Facilities also include spa with Jacuzzi, fitness center, private dining room, daily laundry service, free wireless internet, satellite TV.